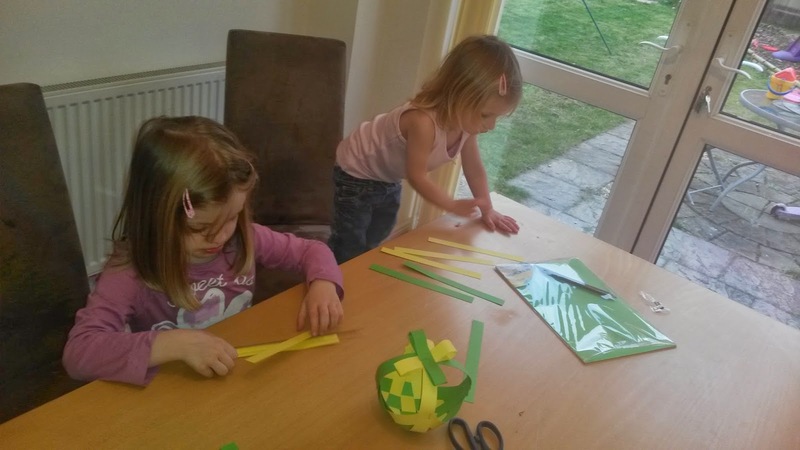 Mummy M's Memories: Easter is coming, which means CHOCOLATE and crafts! 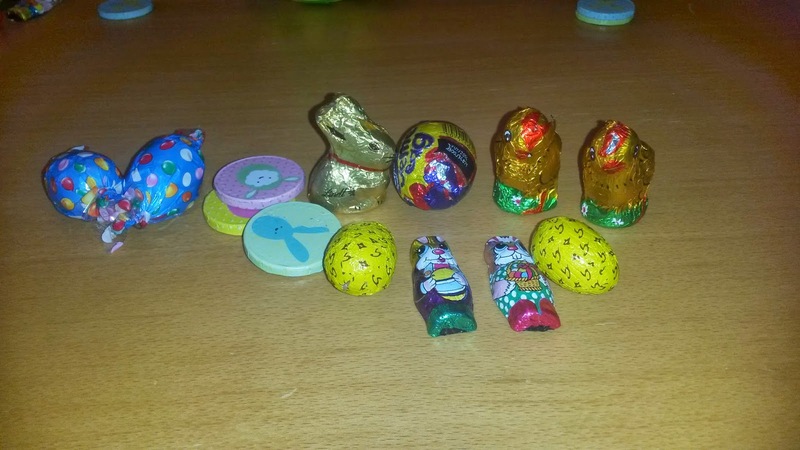 Easter is coming, which means CHOCOLATE and crafts! 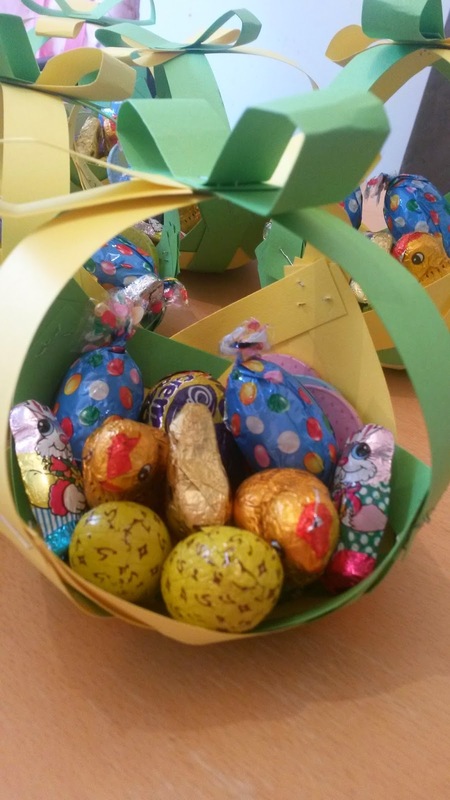 Easter is fast approaching, and don't we know it with all the Easter eggs everywhere in the supermarkets and petrol stations. A dieters worst nightmare! We have 10 nieces and nephews (soon to be 11) so it does start to get expensive, so we have decided to do just token presents for special occasions. And with us seeing 8 of them this coming week, thought we would save a lot on postage, and give them their chocolates early. (Yes I'm a penny pincher, if I can save money on something, I WILL!) Last year one of my sisters made a little basket for the kids with a few little chocolates in, which we found perfect, as they could have as much or as little as they wanted (or we wanted them to have) without the whole egg being left in a bowl ready for mummy and daddy and to pinch a bit each time we passed. So I decided to make a different type of basket with J to get a bit of crafting in, and do a variety of chocolates. 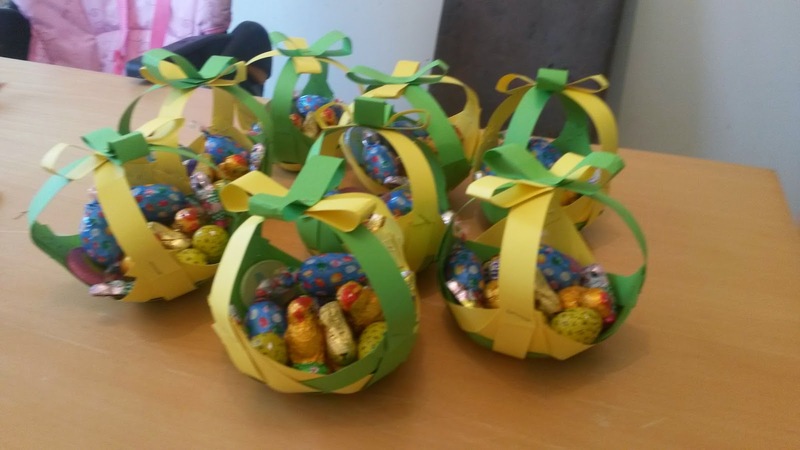 To fill the baskets we gathered these chocolates for each niece and nephew. Then these items. 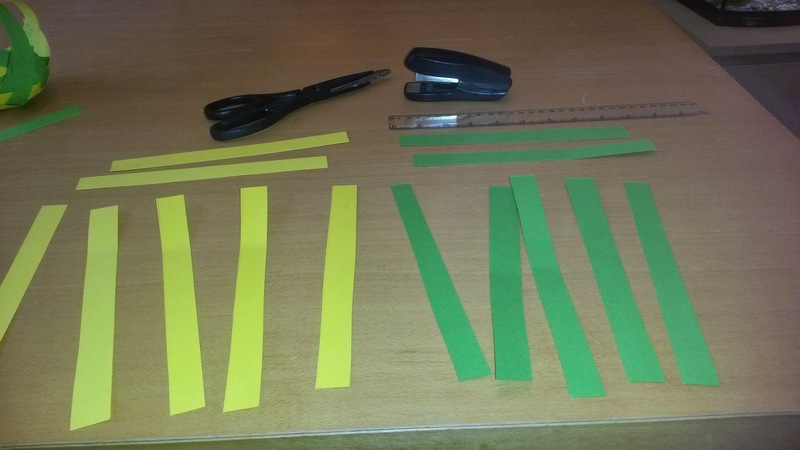 We used card cut into 2cm strips, you need 7 of each colour (2 colours) and a stapler. We then taught J how to weave. 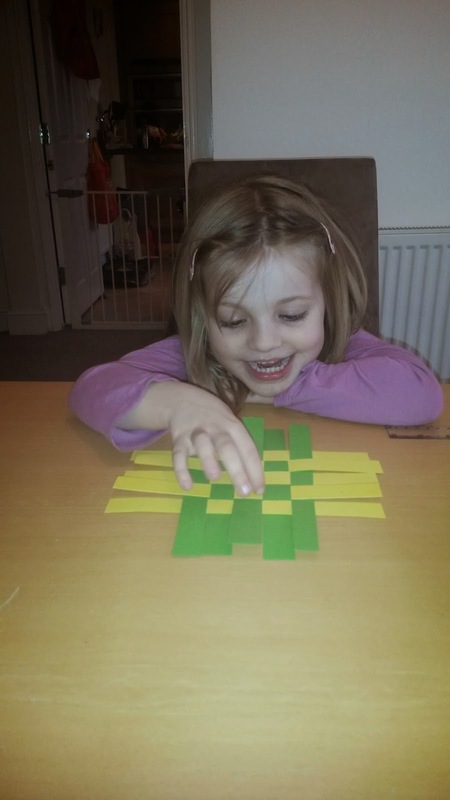 This was her first time, and it was very fiddly with card. You can see her concentrating hard. Eventually after they kept moving every time she added a new piece, a basket weave was created, and a very pleased J saw the amazing result. Once the 5 pieces were weaved, we gathered up each end into a point, and stapled them together. 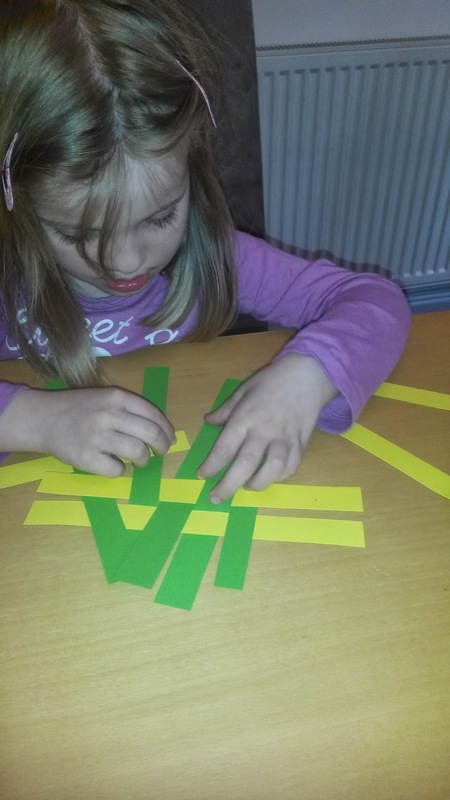 We then used another strip to join the matching colour points together. 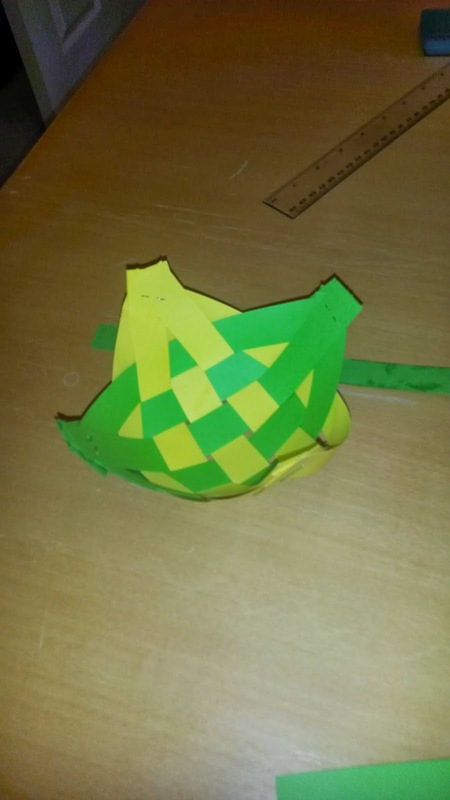 And then the last two pieces to create a bow effect on top, again stapling them into place, to create the basket. J soon got bored/frustrated after doing 1 1/2 baskets, leaving mummy to finish the remaining 6 1/2 baskets. I hope we have some happy nieces and nephews as after the 4th, I was wondering why I chose this idea. Saying that though, I will create 2 more for J and S for their Easter hunt, and possibly 2 more for the other nephews who we will see nearer the time, unless I go for the easy option of an egg. They do look pretty good though, if I do say so myself. I'm happy with them. I used this website for the idea, and step by step instructions.